Menaye Donkor Muntari, Noella Coursaris Musunka, Shingai Shoniwa, Fifi Ejindu, Yinka Shonibare Support AFWL 2013. | Welcome To Doreez's Blog. For The Latest In Fashion, Beauty & Style. Menaye Donkor Muntari, Noella Coursaris Musunka, Shingai Shoniwa, Fifi Ejindu, Yinka Shonibare Support AFWL 2013. The countdown has begun for London fans of African fashion. 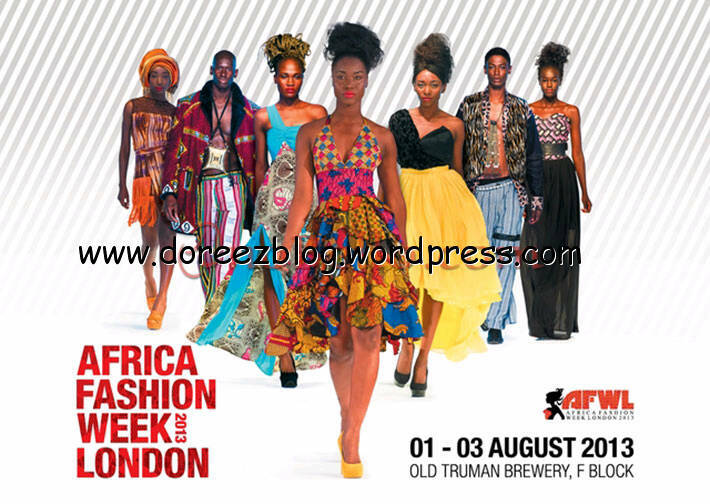 The third edition of Africa Fashion Week London (AFWL) is set to return 1-4 August 2013 and there is just one month to go! In a bid to grow bigger, AFWL has not only expanded to three days but also moved to a bigger venue, Old Truman Brewery, in Shoreditch, London. AFWL celebrates the work of African and African inspired designers in the UK. The annual event debuted in 2011 and welcomed 4,700 visitors followed by its sophomore edition in 2012 at London Spitalfields which attracted over 20,000 visitors. aims to be the single, biggest African event in the UK. This year’s event is set to see 100 designers on the runway and over 100 exhibitors spread across Old Truman Brewery’s massive indoor space, once again making AFWL the biggest fashion event across Europe showcasing African and African-inspired fashion. AFWL ambassadors are just as fabulous – three gorgeous, glamorous and gifted ladies of African descent. Last year’s ambassador, Ghanaian model Menaye Donkor Muntari is joined by fellow model and philantrophist, Noella Coursaris Musunka of Congo and Noisettes lead singer of Zimbabwean descent, Shingai Shoniwa. patrons this year, Princess Fifi Ejindu, the Nigeria-based architect and businesswoman and Yinka Shonibare MBE, the London-based globally celebrated Nigerian fine artist. opportunity for Africa to showcase the talent that we possess. The era of the hungry African child is long over and it is now time for our culture to be recognised globally,” said Mrs. Ejindu of AFWL. contributed to the growth of youth and women empowerment in Africa. some have the opportunity and the funds to start their fashion labels, many others have no one to give them an opportunity or the funds they need. We have all the natural resources and all the talent in Africa but we should not leave it just to our leaders to help progress. If each of us were to sweep our own doorstep, the world would become a cleaner place. Therefore, this is our way to help emerging talent to a global platform and the funds they need,” Ejindu added. ← Celebrity Stylist & Designer Toyin Lawani Does It Again With ‘Elegante Kidz’. House of Doreez Skills Acquisition Program. 17 Year Old Queen Onyemaechi From AJ City Wins Nigeria’s Next Super Model. The Complete List of Winners at the 2014 Headies. Photos From The 2014 Africa Magic Viewers Choice Awards! Actress Liz Benson Makes A Come Back In “Mummy Dearest”.